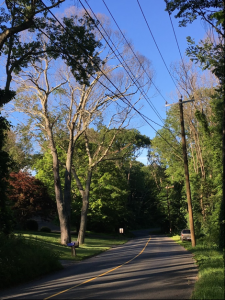 During the early summer of 2018 it became apparent that numerous trees throughout eastern and southern Connecticut did not produce leaves this spring, having died sometime during the winter. While it is not unusual to lose a tree or two to natural causes here and there at any time of year, the massive scale and extent of oak tree (Quercus spp. )mortality during the winter of 2017 to 2018 due to the combination of recent gypsy moth (Lymantria dispar) infestations and associated drought conditions is notable and concerning. Combined with the anticipated loss of ash trees (Fraxinus spp. )in many areas due to the invasive emerald ash borer (Agrillus planipennis), which has been moving across Connecticut from where it was initially found in northern New Haven County, the sheer numbers of LARGE standing dead trees throughout the state presents what might best be described as a slow-moving environmental disaster. Emerald ash borer first appeared in the Connecticut landscape in 2012 after a slow but relentless spread across the country and has been gradually decimating the ash population in Connecticut since that time. A long period of detection sampling and information dissemination has raised the awareness about this pest with professionals, elected officials and members of the public. 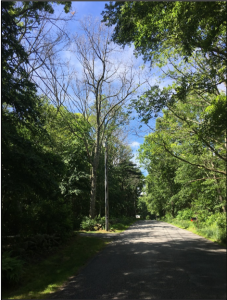 We’ve known it was coming and in many ways arborists, foresters, town staffs, CT-DOT and utilities have been preparing for it. 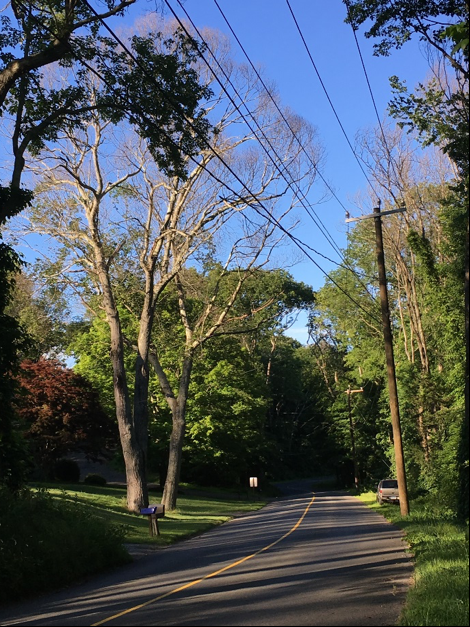 The sheer degree and extent of oak tree mortality in southeastern Connecticut, on the other hand, was unexpected and has overwhelmed many homeowners, Tree Wardens, foresters and others. Many adult citizens recall severe gypsy moth defoliations during the early 1980s. 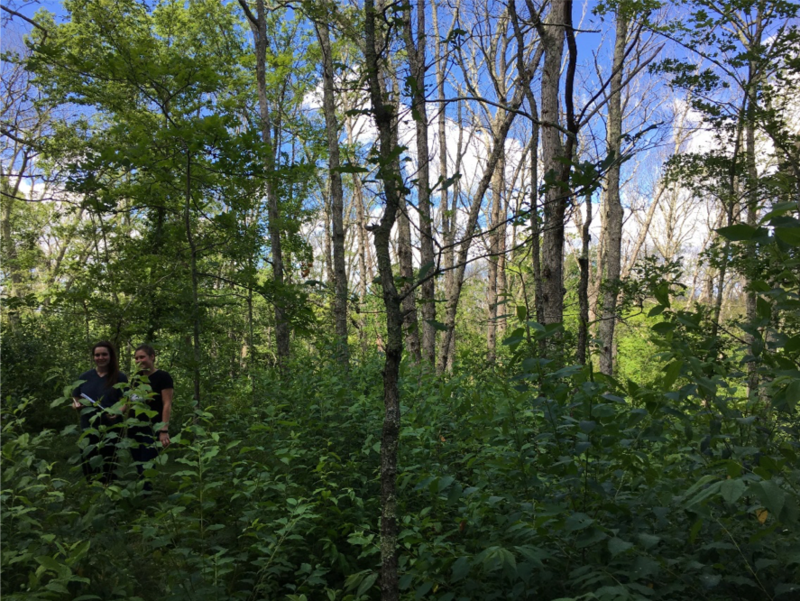 At that time the forest took on a winter-like appearance across a large portion of the state for a couple summers in a row as the population of gypsy moth caterpillars exploded into our vast oak forest canopy. The caterpillar population then crashed as quickly as it grew (due to caterpillar disease factors) and since that time fungal and viral diseases, among an assortment of other caterpillar predators, has kept the population in check. Those of us that take note would see only spot infestations in various locations since that time. During the 1980s, as expected, trees produced a second set of leaves each of those summers, and while there was some mortality, the severity was not as intense or as wide-spread. Also, in some places an additional secondary mortality event is evident. Early and mid-season browning of leaves on individual trees that leafed-out and seemed fine this spring indicates that other pests or diseases are continuing to affect previously stressed trees. Among the factors that might be responsible are two-lined chestnut borer, a native pest, and armillaria fungus, also known as “shoestring” fungus. First, very large dead trees with wide spreading crowns are very numerous along some roadways in eastern Connecticut. These conditions seem quite variable. One can drive several miles along a local road and not see any dead trees and then pass a stretch that has as many as 30 or 40 dead trees per mile. Implications for public safety are apparent. Second, there are forest stands throughout the affected area experiencing severe mortality rates. This author has been in stands ranging from a few more dead oaks than usual to as much as 80-90% canopy loss. And these are not necessarily the poor-growing, stressed and uncompetitive trees, but are often tall magnificent trees with large crowns that seemed most robust and healthy. Assessment efforts are underway to ascertain the degree and special extent of mortality in forest stands. From a timber value standpoint the potential for severe economic loss for woodland owners is potentially staggering. The total volume of commercially valuable timber, standing dead, that might be salvaged is beyond the capacity of the timber industry to address it. 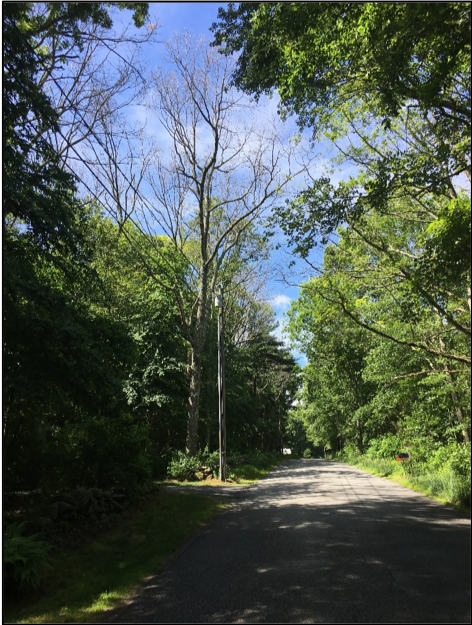 From a public safety point of view, the numbers of dead trees that have the potential to ultimately impact roadways and power lines is well beyond the capacity of property owners, town budgets, CT-DOT and/or utilities to address. Initial data from a random sampling of ninety miles of local roads in several towns from Sprague to Haddam has indicated an average of 18 dead roadside trees per mile, half of which can be categorized as high potential risk. This roadside tree mortality survey is continuing on more local roads in more towns. Additional survey data is being collected by a team from UConn. During roadside tree mortality surveys, a tree will have been characterized as high potential risk if it is a large tree, with slight to severe lean toward the road and/or with most of its limbs and branches over the road, such that if not removed, half or more of the mass of the tree will, over time, eventually drop in the road. A sampling of roads in East Haddam, for example, where mortality from both gypsy moth and emerald ash borer is occurring, indicated 134 such high-potential-risk trees on 21 miles of road (smaller, less-potentially risky trees are not included, but are much more numerous) for an average of about 6 problem trees per mile. At a cost of somewhere between $500.00 and $1000.00 per tree, just those 134 trees will cost upwards of $67,000, perhaps over $100,000 for removal. State data for local road mileage estimates 118 miles of local roadway in East Haddam, the problem dwarfs the $25,000 annual budget the town allocates for tree issues. One or two or a half-dozen dead trees along roads in town might be “acceptable” risk, but if the sampling data is accurate and we estimate over 700 potentially problematic trees in town, it will (if not addressed) become downright risky to drive or walk in the community over the next few years. Key are the phrases “potentially problematic” and “over the next few years”. Unlike ash trees, dead oak trees do not decay and disintegrate in a short period of time. The first heavy, wet snow will bring down small twigs and branches this winter, next summer, larger limbs and branches will decay and drop, a few at a time. Larger limbs and trunks of oak trees might retain some structural integrity for another 3 to 5 years, but eventually the root system will rot and, gravity being the law, the entire remainder of tree will topple in whichever direction it leans. The more severe the lean, the sooner it will happen. Liability for possible damage or injury, even a few years from now when gypsy moth is old news, is likely to rest with whoever owns or is responsible for the tree in question. Roadside tree mortality presents a serious potential public safety hazard. The scale and scope of the problem is beyond the capacity of CT-DOT, Eversource and many towns to address the issue. Time is of the essence. Dead trees are unpredictable and dangerous for tree workers and timber operators, and become more dangerous the longer they stand. Additional assessment data is essential, plans to continue that effort should be encouraged. Emergency funding and logistical support should be sought. Is FEMA an alternative? Recommendations for homeowners and landowners with dead trees near boundary lines or roadways are to obtain the help of an arborist or qualified tree service as soon as possible. Dead trees are hazardous trees and the owners of hazardous trees can be liable for damage or injury they might cause. The sheer number of trees that need attention has made it difficult to contract with arborists, so be persistent, but also be careful about engaging inexperienced or unlicensed contractors. Check references. A listing of licensed arborists can be found at the web site of the Connecticut Tree Protective Association, www.CTPA.org. Woodland owners are advised to consult with a Connecticut Certified Forester about the condition of trees on their properties. Recommendations for management actions will vary depending on morality severity and size of that affected area. A listing of Foresters can be found at the CT-DEEP Forestry Division web page. Look for the “Certified Forest Practitioners” listing. Text within the document explains the roles and authorizations for different levels of certification, and is important to note. Landowners should be aware, however, that trees can lose some commercial value once they have died, and that stands with numerous dead trees to harvest are likely to be extremely dangerous to work, again potentially affecting value. Please do not attempt to remove or harvest dead trees on your own without proper personal protective equipment (hardhat, eye and ear protection, chaps) and some chain saw safety training. Woodland owners with specific questions can contact me at thomas.worthley@uconn.edu. This entry was posted in Education, Environment, Land Use, Natural Resources and tagged dead trees, emerald ash borer, gypsy moth, maple, oak, tree removal, trees, UConn Extension.